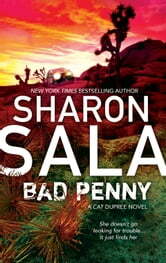 Cat Dupree would love nothing more than to settle down and build a life with fellow bounty hunter Wilson McKay. But Soloman Tutuola – the man who murdered her father and slashed her throat when she was thirteen – haunts her even from the grave. An investigator from Mexico is tracking down the person who is responsible for Tutuola's death – and the trail leads directly to Cat. To add to her bad luck, a junkie with a vendetta is stalking Wilson and is willing to kill anyone who gets in the way of his revenge. Desperate to start their future together, Cat and Wilson turn the manhunt around – vowing to do whatever it takes to find freedom from the past and the scars that have damaged them both.